The Christmas markets and bright decoration all over the places hit clearly that the holidays are coming. The first gift you are going to get this year is support of an automated products export from Weebly shopping cart to any of 70+ available e-Commerce platforms! Magento, WooCommerce, Shopify, PrestaShop, OpenCart and many other powerful shopping cart systems are now at arm's end. Taking into account that Weebly is largely oriented on beginners of e-Commerce business, the question of an effective migration is becoming an acute issue for store owners who are ready for further market expansion. And such a possibility, to leave your roots behind and to go for something more feature-rich and flexible, is now provided by Cart2Cart. This automated tool allows to transfer your vital data like products, categories, attributes, images to the desired platform accurately, swiftly and with no programming needed. Push your boundaries and take your business to the next level by performing a seamless data export from Weebly using Cart2Cart service! To experience the advantages of an automated migration -- start with FREE Demo right now. 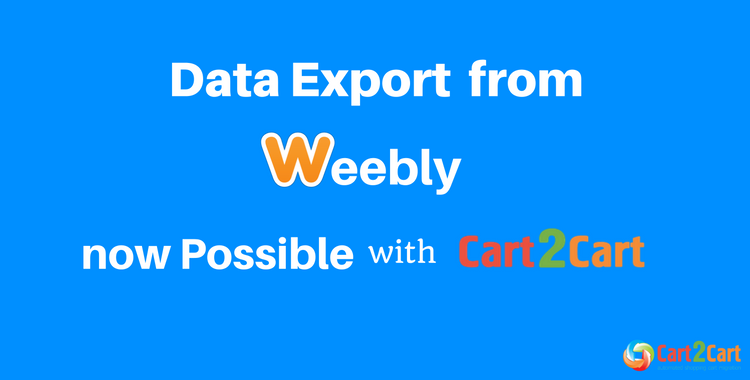 One thought on "Data Export from Weebly Shopping Cart is Now Possible with Cart2Cart"